Could the deal pave the way for greater regional cooperation in Afghanistan’s fight against terrorism? Since the beginning of the nuclear negotiations between P5+1 and Iran, there has been much debate about the deal’s potential impact on the Greater Middle East, including Afghanistan. The Afghan government supported the multilateral negotiations process, and now welcomes its win-win outcome, as outlined in the Joint Comprehensive Plan of Action (JCPOA), which the involved parties recently adopted. The success of the nuclear deal demonstrated the triumph of patient, resolute diplomacy over the application of hard power, which has sometimes proven counterproductive. 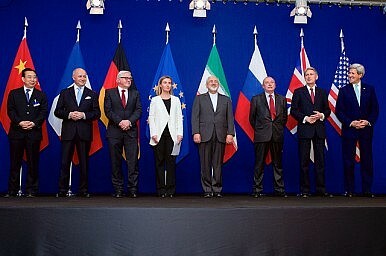 Thus, the key lesson to be learned from the nuclear deal is that other protracted problems facing the Greater Middle East could be resolved through results-oriented multilateral diplomacy, so long as the stakeholders commit to a strategic, win-win vision backed by the political will to overcome their increasingly shared security problems. On what can transpire after the nuclear deal, one can think of different scenarios. However, Afghanistan is cautiously optimistic about the full implementation of the JCPOA, under which both sides will have to fulfill their obligations. Doing so will undoubtedly build confidence between Iran and the United States, which one can hope will evolve into a much-awaited rapprochement between the two countries with many converging interests. Moreover, the nuclear deal has already diminished the concerns of Iran’s neighbors about the further nuclearization of the Middle East. And Afghanistan welcomes the pragmatic efforts of President Hassan Rouhani and Foreign Minister Mohammad Javad Zarif, as they are certain to capitalize on the nuclear deal to enhance regional security and economic cooperation. Iran is one of Afghanistan’s key neighbors, and a country with which the Afghan people share extensive civilizational, cultural, religious, and linguistic ties. And that is why Iran has been as interested in the stability, peace, and prosperity of Afghanistan and actively contributed to them as Afghanistan has been in those of Iran. In other words, the two nations’ destinies are intertwined. And this is an understanding that has informed and underpinned their friendly relationship and developing strategic partnership. From Afghanistan’s resistance against the Soviet occupation in the 1980s and its struggle against the dark forces of extremism and terrorism in the 1990s to its collective efforts since 2001 for the stabilization and reconstruction of Afghanistan, Iran has firmly stood by the Afghan people. Back in 2001 and 2002, Foreign Minister Zarif was instrumental in helping the international community, including the United States, achieve a successful outcome through the Bonn Agreement that established the post-Taliban Interim Administration in Afghanistan. This process set in motion the subsequent and critical steps that formed a permanent government based on a progressive constitution that guides the Afghan political order today. Since then, Afghanistan and Iran have maintained a robust bilateral relationship backed by routine official exchanges at the political and technical levels. The government and people of Afghanistan appreciate the overall assistance, amounting to $673 million, which Iran has pledged and provided for various developmental projects, including transport infrastructure, education, agriculture, law enforcement, and institutional capacity building. With the assistance of Iran and the rest of the international community, Afghanistan has come a long way since 2001. The country has made steady progress in all aspects of its stabilization and reconstruction processes. While Afghan forces have completely taken over the security responsibility from their international counterparts, Afghanistan’s socioeconomic indicators have improved significantly. More than a year ago, the political power was democratically transferred, and the National Unity Government of Afghanistan, which is firmly committed to a self-reliance-based reforms agenda, was established. In reorientation of its priorities, Afghanistan’s neighbors, including Iran, occupy the first circle of Afghanistan’s foreign policy for bolstering regional security and economic cooperation. Afghanistan and Iran are commonly concerned about the intertwined threats of extremism, terrorism, and narcotics production and trafficking. In turn, they share these concerns with the P5+1, all of whom have been affected by these same threats to varying degrees. Therefore, the post-nuclear-deal environment should enable Iran to play its rightful role as a responsible and rational state actor in regional and international affairs. In the Afghan context, the United States and Iran may cease the opportunity to collaborate more directly on helping Afghanistan fight terrorism, radicalism, and criminality—which continue to undermine Afghans’ hard-earned gains of the past 14 years at the cost of regional stability and international peace and security. The ongoing atrocities of the Taliban against the Afghan people have increasingly provided an enabling environment for the convergence of transnational terrorist and criminal networks in Afghanistan. Today, the brave forces of Afghanistan are battling terrorists from Pakistan, Tajikistan, Uzbekistan, China, Russia, and the Middle East. In other words, Afghan forces are fighting the whole world’s war against terrorism, extremism, and drugs. However, if they are to defeat and eliminate these common threats that undermine the stability of every country in the region and beyond, regional and extra-regional stakeholders, like the United States and Iran, need to move beyond the status quo and jointly initiate concrete measures for stabilizing Afghanistan and securing its future. And as Iran is relieved of the debilitating sanctions, Afghanistan looks forward to building on its extensive economic relationship with the country, while encouraging closer cooperation between Iran, India, and the United States to support the implementation of major regional connectivity projects, such as the development and utilization of the Chabahar Port. This would not only give land-locked Afghanistan an additional commercial route but also increase North-South trade and investment that would bolster region-wide prosperity, thereby giving the region’s youthful populations the jobs they need in order to avoid exploitation by terrorist and extremist networks. However, for these expectations to materialize in the post-nuclear-deal era, it is imperative that the United States stay the course and remain engaged in the Greater Middle East. Not too long ago, we learned from the fall of the Kunduz City to the Taliban (and the many terrorist networks that supported them in northern Afghanistan) that in order for Afghan gains to be consolidated and institutionalized, Afghanistan would continue to rely on American leadership and support. And from Iraq’s recent experience, we know that after U.S. forces prematurely withdrew from the country in 2011, Iraq soon witnessed a dramatic reversal in the fragile gains it had made in the preceding years. This is even more instructive in the Afghan case, since the timetabled U.S. military surge in Afghanistan only emboldened the enemy and its regional sponsors to wait out the surge and return to the battlefield with higher morale to challenge and confront the Afghan forces. This is already happening, unfortunately. In light of the above realities, however, the Afghan government and people have recently welcomed a reconsideration by the Obama administration to extend the U.S. military mission in Afghanistan, leaving behind the required number of forces and enablers to continue training, advising, and supporting Afghan forces, as they fight the Taliban and other terrorist networks. To complement America’s unwavering support for peace and stability in Afghanistan, regional stakeholders must step up to the plate and ensure regional leadership and ownership of addressing the challenges that commonly confront and threaten them. To conclude, Afghanistan strongly encourages and supports the implementation of the nuclear deal, in accordance with the JCPOA, which should ease inter-state tensions. This should allow for a more collaborative, win-win environment in the Greater Middle East where regional and extra-regional stakeholders, with common security concerns and shared economic interests, must avoid further delays in cooperating with one another, while multilaterally partnering with Afghanistan to counter and eliminate the threat of terrorism as a longstanding obstacle to regional economic cooperation and integration. M. Ashraf Haidari is a Visiting Fellow at the Observer Research Foundation (ORF) in New Delhi, India. He is also the Director-General of Policy & Strategy of the Ministry of Foreign Affairs of Afghanistan, and formerly served as the country’s Deputy Chief of Mission to India. Prior to this, he was Afghanistan’s Deputy Assistant National Security Advisor, following a seven-year diplomatic assignment in the United States where he last served as the country’s Chargé d’Affaires.